Meet Lisa Gurule and her sons Noah, 18 and Quinton, 9. Lisa works at the Garfield County Clerk and Recorder Office in Rifle. She began this essential career path after years of struggling with underemployment. She worked hard to earn her GED, which allowed her to advance to her current position. In 2012, Lisa and her family moved to Silt and she is excited to finally be able to purchase a home in the community she loves. Lisa is the proud parent of five children and four grandchildren. Her youngest son Quinton is a student at the Two Rivers Community School and Noah will be attending the prestigious Colorado School of Mines this fall, where he will be studying Petroleum Engineering with the goal of an overseas career. A Habitat for Humanity home will provide long term stability for the Gurule family, a place they can gather together for years to come. Meet Renae & Joshua May and their daughters Erin, 10 and KayLynn 7. 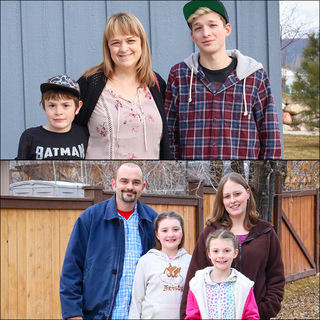 This local hard-working couple meet at and graduated from Rifle High School. With two young daughters, this family was hit especially hard by the economic downturn. They felt like they were on the right track; purchasing an older mobile home, steady jobs, and systematically saving. With the building economy gone, their savings was quickly wiped out, they were forced to declare bankruptcy in 2012. This tough lesson has helped this family become even stronger and focus on their families true needs not wants.